From the offset, the founders of Adjuvo (Mark Lovell and George Fielding) wanted to steer away from the term ‘care’ or ‘help’ as they focus on enabling individuals to lead the life they want to lead, with the support need to do it. 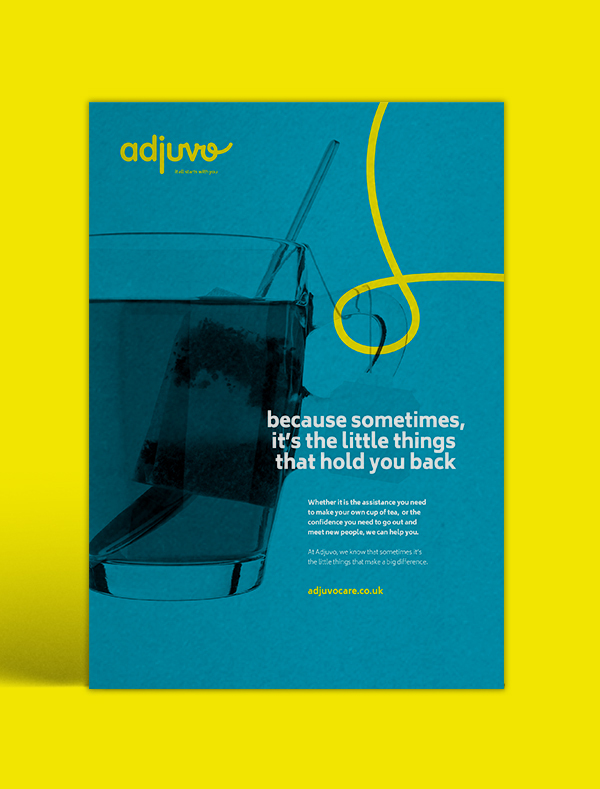 Ultimate were tasked with creating a vibrant new brand for Adjuvo (latin for ‘assist’). The brand needed to demonstrate that Adjuvo are the change their industry needs, proudly steering away from care home brands that are drab, with no real passion behind their mission and who are ultimately motivated by money, rather than improving the lives of their users. The brand that Ultimate created for Adjuvo had to reflect their devotion to putting people first, by listening to their users’ needs and wanting to know more about them as a person. Adjuvo recognises that an individual’s interests, passions, environment and communities hold the key to living life better. From the first meeting with the Ultimate team, George and Mark’s excitement for their new company was palpable and it was clear that their mission to make a difference to people’s everyday lives and their families was a personal one. We couldn’t wait to get started on this exciting campaign! Ultimate were tasked with producing a brand for Adjuvo that emphasised putting the individual first, not just by meeting their needs but also by discovering what activities they enjoy doing or where they like going and through this, working on how best to enrich their everyday life. 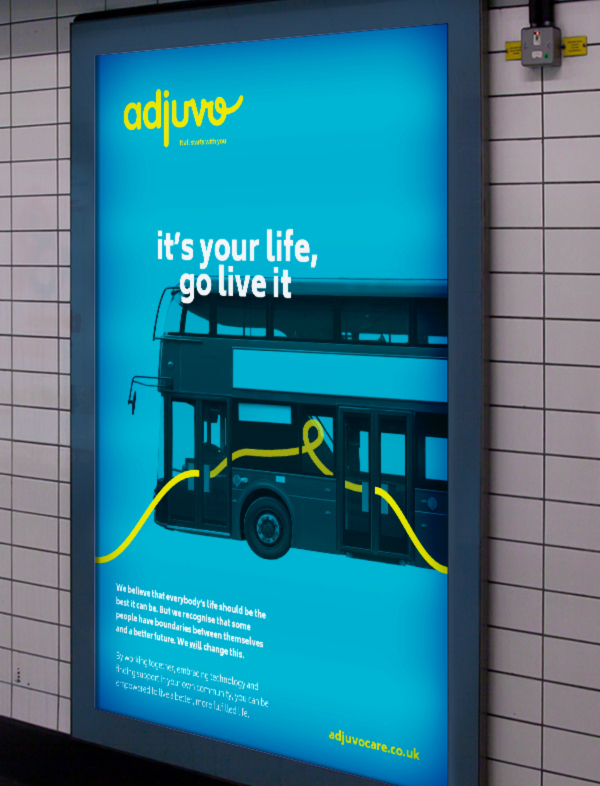 Adjuvo’s brand had to make people aware of their organisation in the supported living sector and to engage with a wide range of audiences. Adjuvo needed to present itself as professional, whilst bringing colour, happiness and ease to the care industry, in order to distance themselves from other providers. Ultimate needed to find the right balance to ensure the Adjuvo brand engaged with the end-user and their family members in addition to local authority commissioners and social workers. It was important that George and Mark’s personal passion for improving people’s lives fed through into the brand. Ultimate also had to ensure that this brand would stand the test of time, as it would form part of Adjuvo’s identity and stay with them through any future changes in their business model. Ultimate recognised that the essence of Adjuvo would be to engage, empower and assist people to change their own future. The logo and strapline “it all starts with you” sprang from Adjuvo’s focus on empowering the individual. The design team chose a vibrant teal and yellow to highlight the vibrant, compassionate and friendly personality of the brand, which also fed into the tone of voice when communicating with their audience. The brand Ultimate created has a continuous line travelling through it, the starting touch-point of the line being the “u” (you) in the Adjuvo logo and from there, the line continues to flow through the brand in the photography and typography, visually emphasising the brand strapline “it all starts with you”. This created a powerful message as Adjuvo offers a helping hand to every person their brand touches. Ultimate’s design team used the interaction between the line and the people pictured in the brand’s photography to show how Adjuvo assists users in doing the small things that really do matter. People are pictured making a cup of tea (rather than having it done for them), opening a jar or catching a bus across town from A to B. These activities may seem simple, but for Adjuvo’s users they can be incredibly challenging . Adjuvo is passionate about assisting its users in living their lives as independently as possible, by supporting them to do the small things that mean the world not just to the end-user but also their families, social workers and commissioners for the local authority, who play a part in providing funding for Adjuvo. It was important to show that whilst supporting these people, Adjuvo will always sit in the background. Within the photography, there’s no physical person there helping, just the line that links the individual with the support provided by Adjuvo. By doing this, Ultimate expressed Adjuvo’s mission to empower people to need less care and support in the future, by being as independent as possible. It was also important to make sure that the photography didn’t focus on the individual’s disability, instead concentrating on the person. Adjuvo’s users are shown in the photography to be real people with real lives, thereby leaving behind the negative aspects of care industry providers that aren’t personal. In order to make Adjuvo stand out further, Ultimate developed a tone of voice for the brand. Companies in the care industry find it difficult to get their message through and demonstrate that they really care about the individual and their needs. For this reason, we created an empowering but empathetic voice that connected with the Adjuvo’s audience with phrases such as ‘enjoy the freedom to be you’. The line used within the photography is also shown threading through the lettering of these statements making sure the entire brand concept weaved together seamlessly.